We have always been firmly planted in the Earl of Sandwich is our favorite place to eat in Orlando, Florida category. With it’s sweet and tender bread, perfectly seasoned meat, and the Holiday Sandwich to put all other sandwiches to shame, we had no reason to stray. Until we discovered Sofrito Latin Cafe. What was that I said about Earl of Sandwich? * I can’t think due to the sensuous reminder of caramel covered crispy churros and corn pancakes named cachapas. 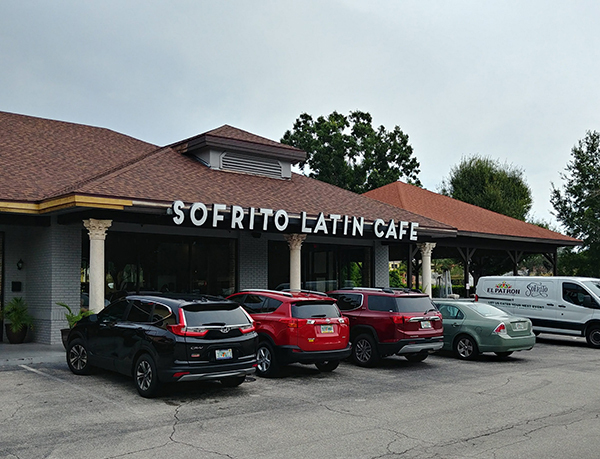 Sofrito Latin Cafe is directly across the street from the Good Neighbor Hyatt Place in Orlando, and around the corner from Disney Springs. If you are coming to Walt Disney World, it’s conveniently located, and if you aren’t, you should come out of your way to eat here. It looks like a little nothing building in nowhere land that doesn’t deserve the time of day, but my, how looks can be deceiving. 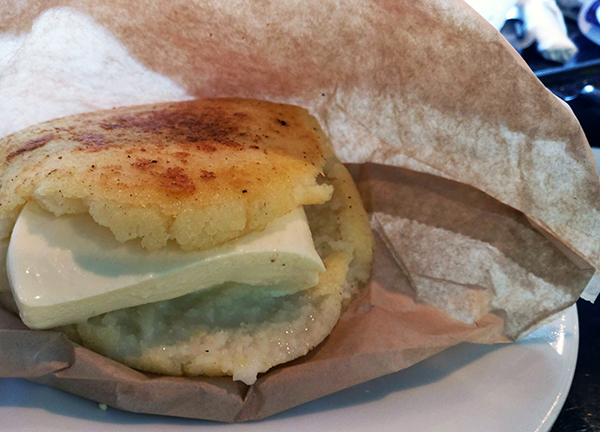 We indulged in chewy arepas, soft cachapas, savory empanadas, and even a delicious salad. 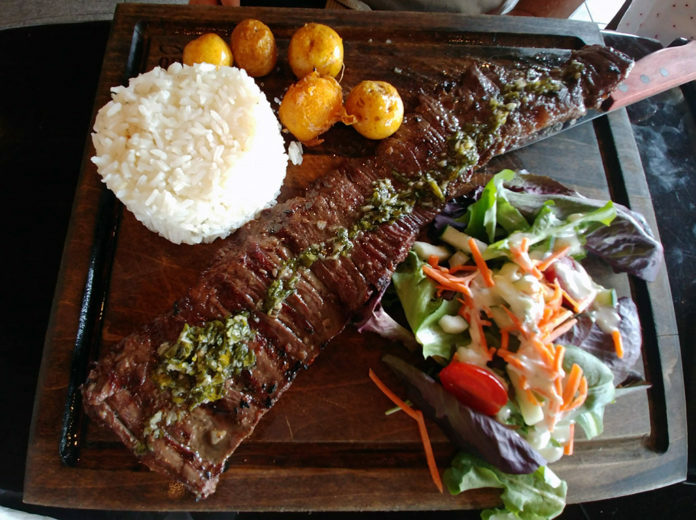 The red skirt steak Churrasco was amazing. Each dish exploded with unique flavors and spices that overwhelmed the taste buds in the most satisfying combinations. 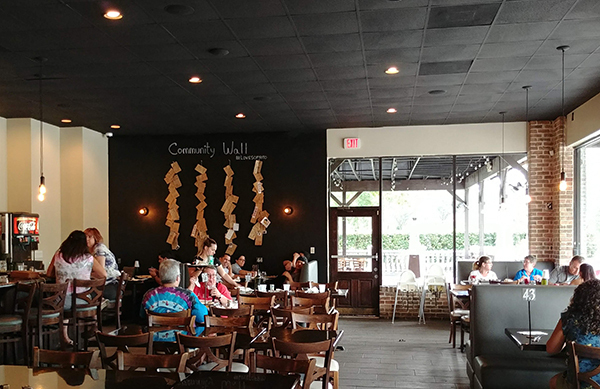 The inside of Sofrito Latin Cafe’s restaurant itself is spacious. Customers seat themselves, and order at the front when ready. 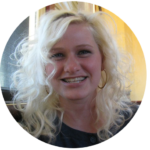 A server will bring you water and your food, but does not wait on you, and a tip is not expected. Beautiful mahogany colored tables with benches line the walls of the restaurant with drawings from patrons on the walls. A self serve drink station is also available. You would be remiss to end your meal without an order of churros. 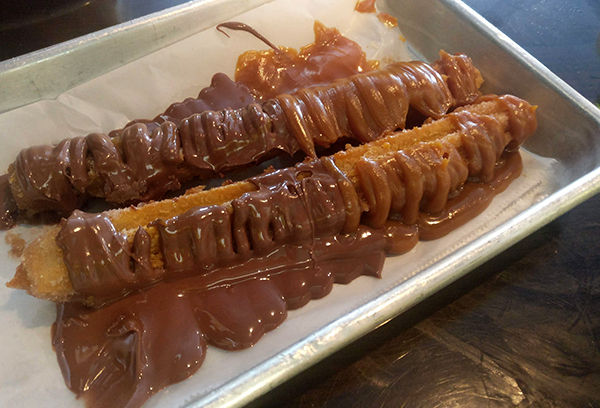 Two deep fried and crisped churros smothered in chocolate and caramel. If you think you’ve had churros before, you’d be wrong; whatever you had before was a doughy flimsy mess. The churros that Sofrito Latin Cafe offers are flawless. 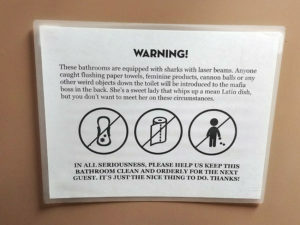 Don’t leave without visiting the bathroom. ► For Kids: The spices at Sofrito Latin Cafe are told like the Story of the Three Little Bears. Kids will find something that’s juuuust right for their taste buds. The rice and beans that accompany every meal are perfect to divvy up between three little hungry munchkins, plus an Arepa to share and Churros to wrap up the meal. 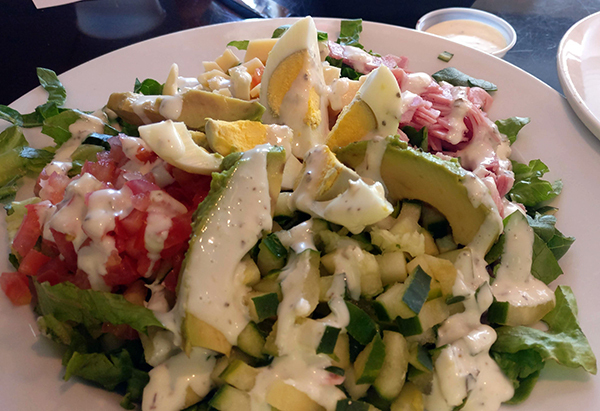 Where is your favorite place to eat in Orlando? We love checking out new places and love recommendations! 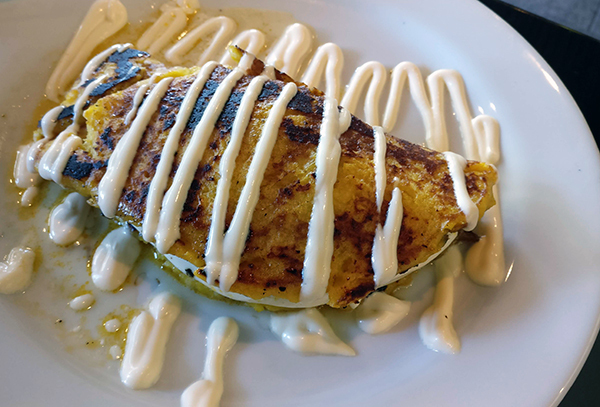 ► Nap-Time Version: Sofrito Latin Cafe is our new favorite place to eat in the Orlando area with sensuous caramel covered crispy churros and corn pancakes named cachapas. There is definitely no shortage of tasty places to eat in and around the Walt Disney World complex. Check out our other reviews of local places to eat like Amorette’s Pâtisserie and Cookes of Dublin (coming soon)! *Disclaimer: We still really love Earl of Sandwich.